TIG is short for Tungsten Inert Gas, the tungsten bit is the electrode from which a plasma arc is struck, the inert gas surrounds the tungsten and the weld to prevent oxidation. We are often asked to weld aluminium parts or repair alloy wheels. 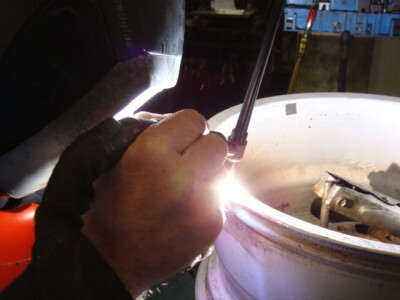 We have welded hundreds of alloy wheels and this picture shows us welding a BMW wheel for a customer. To be successful welding aluminium, the parent metal has to be scrupulously clean. This means that the wheel is thoroughly cleaned to remove any dirt, corrosion, paint or powder coating. Any contaminants present will either burn and contaminate the weld or find their way into the molten aluminium. Both will result in a weakened repair. When welding you should preheat the wheel, use a steady and generous flow of inert gas (we use pure Argon), use clean filler rods and clean equipment. While welding, you need to be very confident that you have a good quality, full penetration weld. This means that molten aluminium has flowed through the entire thickness of the join. Again, any part of the join containing impurities or “dry” spots will result in a poor quality join. Try not to get any “sinks” in the weld too, otherwise you’ll be taking off too much of the parent material when you clean up the weld. When the welding is finished and the wheel cooled, we manually reshape the rim using files, abrasive paper and a big dollop of skill. We then paint it with a quality grey primer to give the area some protection from the environment. You should note: Alloy wheels and their manufacture is a very skilled process and precise production sequence. Wheels are often cast, rough machined, heat treated to a very accurate schedule (you can look this up on Youtube) and finally finish machined to a high tolerance. Welding is a heat intensive process, the metal is liquid by definition and this local heat treatment is bound to affect the integrity of the wheel. Heat treated areas will often be a little softer than they were when they left the factory and another pot hole in the same zone can lead to even more damage. We have just purchased a new Miller 350 Dynasty inverter welding set. This gives us much greater control over the weld conditions, it allows us to reduce the amount of heat input to the work and less heat input means less distortion. We are getting great results from this new technology too. Call us on 01372 272380 for your alloy welding needs.